Brad Point Bits cut accurate and clean holes. They are made out of high speed steel to stay sharp a long time. The Vortex drill bits make clean accurate holes due to the exclusive spurs on the end of the bit. These bits are made of high speed steel with polished flutes so they will stay sharp longer and cut faster. They will run better at higher RPMs (between 2,000 and 3,000) drill hundreds of holes before dulling. Made in Germany, the Colt precision drill bits are made from M2 High Speed Steel for longer life. 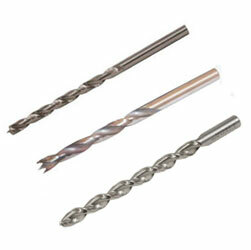 These bits can drill up to 1,000 holes without sharpening depending on the density of the wood. The new patented self-cutting drill point design guides the bit straight in end grain and guarantees a clean entrance and exit hole. The deep parabolic flute shape clears the chips without repeatedly having to back the bit out during the cut. Friction is also reduced by the concave shape of the outer flute area, making for faster drilling and less heat build up.